Shoveling fluffy snow is approximately 5 lbs per shovel load and wet, heavy snow can be near 20 lbs. Most injuries suffered while snow shoveling occurred in men over 25 and involved soft tissue (muscles, tendons or ligaments). Snow shoveling can be a great cardiovascular workout, but can lead to an overload of the system and cause a heart attack. The blade of a snow shovel should be made of lite weight materials such as plastic and be a maximum of 18 inches wide. If you injure yourself while shoveling snow, seek the advice and treatment from a Physical Therapist. The relentless pounding of major snowstorm can paralyze an entire city and even region. Once the weather calms, we face the challenge of shoveling sidewalks, driveways and parking lots to make it easier to walk and drive. Some cities have even begun to fine citizens and businesses that fail to shovel snow on their sidewalks. If we have to shovel, how can we avoid injuries? 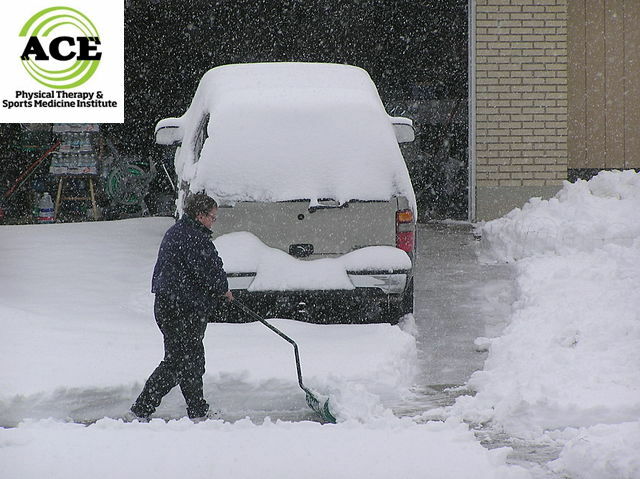 Shoveling snow can cause injuries to many body parts due to the nature of the work. It is repetitive and involves a material that might weigh a significant amount if there is a lot of moisture in the snow. The low back is the most commonly injured body part and the L5-S1 location is the most susceptible secondary to the posture and body mechanics used to hoist snow from one place to another. When people shovel snow, they push the shovel into the snow and move it horizontally or vertically away from a given area. The act requires a great deal of energy expenditure and force production in order to generate the power needed to move the snow shovel. The body has to contract nearly every muscle at some point in the motion. The amount of compression and shear force that develops in the lumbar spine due to the flexed posture at the beginning and rotation and extension movement to move the snow is extremely high and can cause damage to the joints, discs or soft tissues of that region. As it turns out, one way to reduce injury is through a proper snow shovel. Recent studies comparing the ergonomically curved shovel vs. the classic straight handle snow shovel favor the curved handle. It will better enable a person to avoid a snow shoveling low back injury. When use a shovel with a long, straight handle, we stand more erect, decreasing the shear and compressive forces within the lumbar spine when we are initiating the task of loading the snow onto the shovel. The rotational and extension movements that occur when we empty the shovel from a long straight handle produces a greater shear force and requires more muscle action of the surrounding musculature. The long, straight handle extends the “lever arm” that has to be controlled in order to protect the lumbar spine from injury. 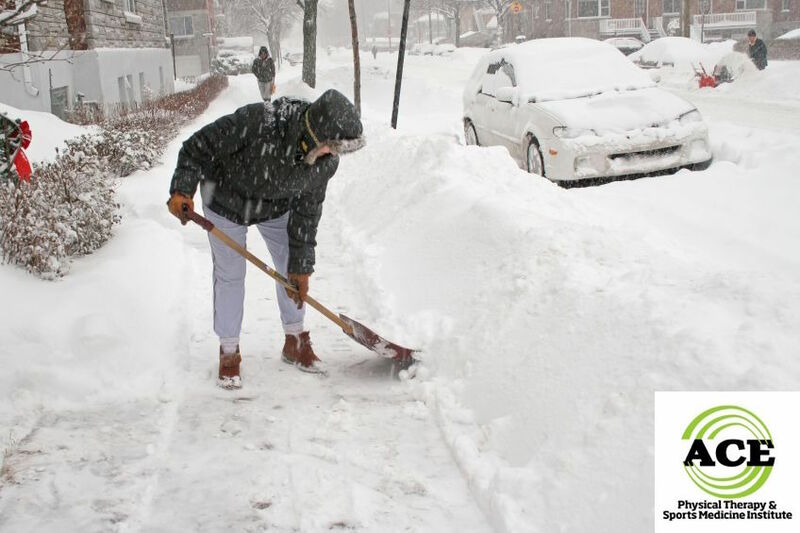 In contrast, the use of a shovel with a curved, ergonomically correct handle will reduce the strain on the back muscles and reduce the compression and shear forces that occur from shoveling snow. The use of these shovels has been shown to reduce the stresses on the back by nearly 20% and the EMG studies (studies that record muscle activity) indicate that the low back muscles are less active. In theory, if the muscles are less active they are not working in excess and should not be predisposed to an injury. The use of an ergonomically correct shovel becomes extremely important for a tall person. The average male height is approximately 5 feet 10 inches tall, therefore anyone over this height will benefit greatly from a curved handle shovel. In the event that you do get injured shoveling snow, seek the advice and treatment from a Physical Therapist. You do not have to see your doctor first and a Physical Therapist is the best healthcare professional to give advice on functional activities. They are licensed professionals and are extremely well educated on the functional motions of the human body. They will be able to evaluate and treat your condition if you get hurt while shoveling snow. If you live in certain areas of the world, you will have to deal with the removal of snow in order to maintain a normal lifestyle. If you chose the proper shovel, it might help you prevent an injury that can occur from this repetitive, strenuous job.